Certain wonderful events come just once a year, like birthdays, Thanksgiving, anniversaries, and back-to-school sales for office supplies. Sadly, a new annual tradition has emerged: claiming that Mars will appear to be the same size as the full moon at the end of August. Post by Edik Der Avakians. While it is reasonable that someone could make a silly mistake, it is entirely unclear how it could have persisted this long. At the end of the day, it doesn’t matter why. The only important thing to remember is that Mars will never appear as large as the full moon in the night sky. Not in 2014; not in 2287. Not ever. The respective orbits of Mars and Earth make their closest approach with one another once every 26 months. The most recent event was this past April, when it just happened to coincide with a total lunar eclipse. This year, that approach left a distance of 92 million kilometers (57.2 million miles) between the planets, and while Mars could be seen with the naked eye, it was still just a small smudge of red light. Just for kicks, how close would Mars need to be to appear as large as the full moon in the night sky? About 780,000 kilometers (485,000 miles), which is approximately 118 times closer than it will ever be. Heck, the Moon’s average distance is about 363,100 kilometers (225,600 miles), so we’d all be in pretty big trouble if Mars got that close. Life is a fickle thing, and to understand the potential for life beyond Earthwe continue to test how microorganisms deal with extreme conditions. The latest experiment looked at how fungi and lichens would fare on the Red Planet. European scientists collected fungi from Antarctica, and lichens from the Sierra de Gredos (Spain) and the Alps (Austria), and theysent them tothe International Space Station (ISS) to experienceconditions similar to Mars. After 18 months, the team analyzed the samplesand discovered that more than 60 percentof the cells were intact and with stable DNA. The results indicate that the harsh conditions of Marsmight not bean insurmountable obstacle, andtheseextremophilespecies might survive. The Antarctic fungi were collected in the McMurdo Dry Valleys, an area that is considered to be the most Martian-like environment on Earth, due to its dryness and sub-zero temperatures. Along with the European lichenspecies, the fungi were placed in EXPOSE-E,an experiment platform developed by ESA that was attached to the outside of the ISS. The microorganisms were in a Mars-like atmosphere, made almost entirely of carbon dioxide,and at a low pressure (0.01 atmospheres). Using optical filters, thesamples were subjected to the same ultraviolet radiation they would experience on Mars. “The results help to assess the survival ability and long-term stability of microorganisms and bioindicators on the surface of Mars, information which becomes fundamental and relevant for future experiments centred around the search for life on the Red Planet,” she added. The findings, published in the journal Astrobiology, might seem incontrast to the lack of bacteria in the Antarctic permafrostreported by IFLSciencelast week, butboth studiestell us something profound about life in the universe. Yes, there are evolved life forms that could survive in extreme extraterrestrial environments, but theres a significant difference between surviving and thriving. Three and a half billion years ago Mars was a completely different place. Water was flowing, the atmosphere was thicker, and maybe some basic forms of life had evolved. Curiositys latest findings provide more evidence for flowing water, but create new questions about the Red Planet. The rocks analyzed by Curiosity in the last seven months have much higher concentrations of silica than any other terrain visited by the rover since its arrival in 2012. Silica, which is a chemical made of silicon and oxygen, makes up 90 percent of the composition of some of those rocks. If the originof the silica is sedimentary, water must have flowed abundantly on Mars. The other alternative is that it formed through leaching,atype of rock weathering due to acidic water. While many minerals in rocks would dissolve, silica would not be affected by the acidic water.NASAs rover Spirit previously discovered traces of sulfuric and hydrochloric acidity, which could favour the leaching hypothesis,but the team is still considering both scenarios until more evidence is found. Another puzzling discovery is the presence of tridymite, a very rare silica (at least on Earth) formed by volcanoes. Researchers are curious about a potential magmatic past on Mars, but they are also testing if there are other ways for this mineral to form. Curiosity is currently climbing Mount Sharp, a feature within Gale crater where it landed 40 months ago. Mount Sharp formed because surrounded terraineroded away, so as Curiosity climbs higher and higher, it encounters younger and younger terrain. Thiswill give us an indication of how Mars went from awet to arid environment. “What we’re seeing on Mount Sharp is dramatically different from what we saw in the first two years of the mission,” said Curiosity project scientist Ashwin Vasavada. Bob Ross would approve of this happy little crater on Mercury. The Messenger Spacecraft snapped this image in October. The crater is 23 miles wide. An impact basin spotted on Mercury looks remarkably like the sweet treat-loving Muppet. NASA released the photo from the Messenger probe on Oct. 13. 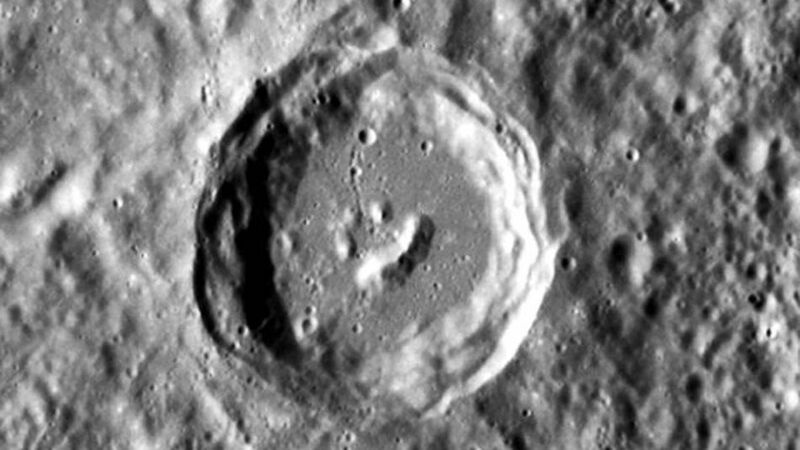 Mercury sure is full of interesting craters. You’d almost think that Hollywood designed the surface of the planet. NASA’s Messenger spacecraft snapped this photo of a group of craters that form the shape of Mickey Mouse. The giant crater in the center is 65 miles wide. “It looks like a blueberry sandwich,” said Matt Golombek, a rover science-team member at NASA’s Jet Propulsion Laboratory, Pasadena, Calif. The Opportunity rover took this picture in 2010 after spending six weeks investigating the 33-foot crater called Concepción. Taken by the Cassini spacecraft, this photo shows the giant eye on Saturn’s Mimas moon. Also known as the Herschel Crater, the creepy spy-like formation is 81 miles wide. How’s that for “Big Brother”? Sending humans to Mars is something that many are hopeful will happen in the next few decades, possibly by the 2040s,according to NASA. But what chance do we have of actually living on Mars permanently one day? In the second episode of the “Further” series(the first one was on aliens), former astronaut Jeffrey Hoffman discusses the possibility of us one day colonizing Mars. If humanity can, some day, establish a presence on more than one planet, weve really increased our chances of longterm survival, he says. Early Martian explorers might face a unique psychological test in being so far from Earth, according to Hoffman. But perhaps they will have a unique goal to turn Mars back into the habitable environment it was once thought to be, with a thick atmosphere and liquid water on the surface, via a process known as terraforming. The video imagines a future Martian explorer using a large facility to heat the Martian core, giving it back the atmosphere we know was lost. Hoffman notes, though, that this is farbeyond the realms of what is possible with current technologies. Thats beyond anything that we can imagine today, he said. But I never like to say never because what our technologies will be like a thousand years in the future, I cant even imagine. The Nakhla meteorite originated from Mars and fell to Earth in Egypt in 1911. It has been studied extensively over the years, and is one of the first indicators humans had about past water and mineral content on Mars. A biomorphic ovoid structure was recently discovered, which strongly resembles some sort of microorganism. Scientists studying the formation ultimately determined it was caused by geological forces and was not formed by a living organism. However, the analyses did reveal an incredible amount of information regarding the composition of Mars and its potential habitability. The research was led by Elias Chatzitheodoridis of National Technical University of Athens and the paper was published in an open access format in the journal Astrobiology. It was not immediately clear how the structure formed. Several hypotheses were kicked around, including that it was formed by ancient Martian microorganisms. In order to investigate the structure’s origins, the meteorite was subjected to a barrage of tests including x-ray analyses, mass spectrometry, electron microscopy, and atomic force microscope topographic mapping. The researchers are confident that the structure was indigenous to the sample, and not the result of any contamination once it got to Earth. The ovoid structure itself is about 80 microns long, 60 microns wide. The average E. coli bacterium is about 2 microns long, so if prokaryotes were involved, it would have taken an entire colony to create a space that large. Eukaryotic microorganisms can easily be as large as the structure. However, they ultimately decided that it wasn’t likely that they were looking at the imprint of alien life. Instead, the data revealed that the structure was likely formed due to geological processes. It appears that the rock from which the meteorite originated had been struck by another object. The shock produced heat and pressure which melted the permafrost and mixed fluids and minerals on and below the surface. It looks most likely that vaporized liquid formed a bubble, which was then filled with the organic material. 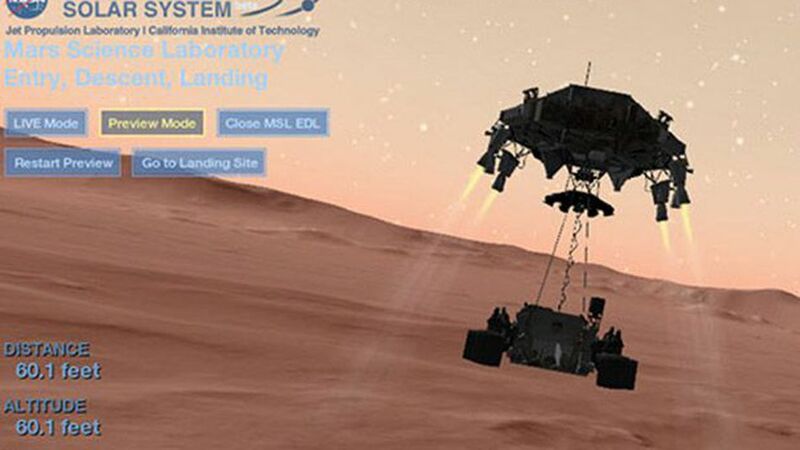 As NASA’s Curiosity rover gets closer to its early Monday morning landing on Mars, the agency has released a spectacular simulator that will take you through every detail of the complicated landing procedure. If all goes according to plan, the spacecraft, officially called the Mars Science Laboratory (MSL), will land on the Red Planet at 1:30 A.M. Eastern Time on August 5. During the “seven minutes of terror,” NASA‘s way of explaining the Rube-Goldbergian process of landing the Curiosity rover on the surface of Mars, it won’t be possible to watch the Mars landing live because of the 14-minute communications delay between Mars and Earth. But an interactive animation of the landing will be viewable in real time in this simulator as it happens early Monday morning. In the meantime, we’ve been having lots of fun playing with this simulator, going forward and backward in time, dragging the mouse to change camera angles, and even looking back at a tiny Earth, way off in the distance. Good luck, NASA. Do you think the spacecraft will land on Mars successfully? Curiosity is NASA’s most digitally savvy rover yet. 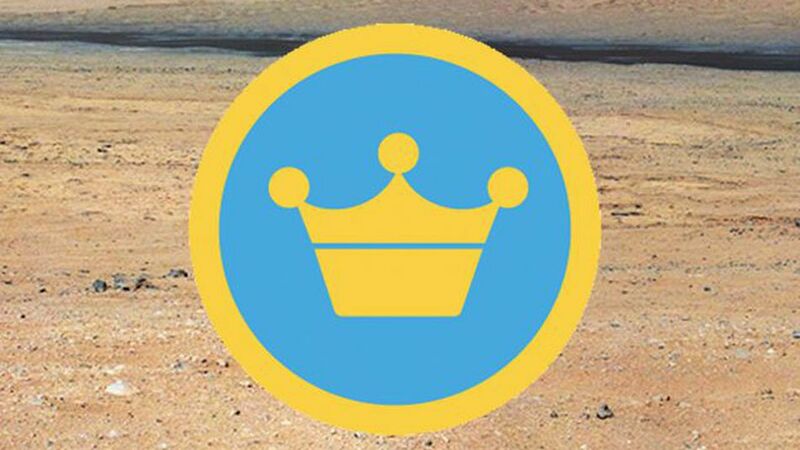 She tweets regularly, posts her pictures and now she is the first Foursquare user to ever check in on Mars. Curiosity’s first check-in was today at the Gale Crater, where she made her first landing on the night of Aug. 5. Located on the equator of Mars, the Gale Crater is home to the 3-mile high Mount Sharp and is Curiosity’s primary target as it holds billions of years of Martian history. “Like any great trip, you want to share with your friends back home, so that is why the rover is sharing check-ins and tips from her amazing trip,” says Stephanie L. Smith, who is part of the three-woman team that runs Curiosity’s social media. “Mars is cold, dry and rocky. Extra moisturizer and sturdy shoes would be a good idea, plus oxygen for those of you who breathe,” she posted along with a snapshot of the desert-like landscape. Curiosity’s next check-in will be from Rocknest, another point within the Gale Crater where the rover will be parked for the next two weeks to conduct various experiments. At the beginning of Curiosity’s tracks, notice the 3.5-inch rock NASA engineers said was partially underneath one of the rear wheels. Volcanoes are many things: spectacular, terrifying, gargantuan, and enigmatic. They free us from ice ages, destroy civilizations and build new islands from the sea as we watch. They captivateboth scientists and non-scientists alike, so whenever a new one is found, its always a cause for celebration. These volcanoes arent on Earth this time around, however.They can be found on a peculiar southern region of our faded crimson neighbor, Mars. As reported by NASAs Jet Propulsion Laboratory (JPL), the Mars Reconnaissance Orbiter (MRO) spotted some unusually textured surfaces inSisyphi Montes, an area packed with flat-topped mountains. The characteristic signatures revealed the presence of a collection of minerals zeolites, sulfates, and iron oxides which can only collectively form from one type of volcanic eruption, one that occurred through a layer of ice. As ice is no longer present in the region, this means that the MRO has uncovered evidence of an ancient subglacial eruption, probably from one of those suspicious, volcano-like mountains in the region. Rocks tell stories. Studying the rocks can show how the volcano formed or how it was changed over time, Sheridan Ackiss, a graduate student at Purdue University, West Lafayette, Indiana, and one of the researchers who discovered the long-lost volcanic eruption, said in a statement. Volcanic activity on Mars is thought to be long-dead, but the epic volcanic monuments left behind within the geology of the Red Planet betray to us its much more violent past. A recent study revealed how one epic volcanic effusion billions of years ago actually tipped the entire planet over by 20. Olympus Mons once squeezed out floods of lava across the Martian landscape; if it grew any larger, it would be so heavy that it would sink into the crust. The mineral patches found in the Sisyphi Montes region, which extends from 55 to 75 south, can only be formed when lava mixes somewhat explosively with ice. Today, the ice-capped south pole is around 1,600 kilometers (1,000 miles) away from this region, which means that ice sheets were once present in this region. We have these types of subglacial volcanoes on Earth too: The Eyjafjallajkulleruption in Iceland in 2010 is a good example of this, where the meeting of hot magma and cold ice generated prolonged, huge ash-filled plumes of steam and lava blebs.